Go sailing in Majorca and join the best sailing trip on the island! You can enjoy a half or full day in the turquoise-blue sea around Mallorca (Portocolom). A truly unforgettable sailing trip with snacks, drinks and a really friendly skipper. This is by far one of the most popular sailing trips in Mallorca. The relaxing sailing trip starts in the harbour of Porto Colom or Porto Cristo. In one of the most beautiful bays of Majorca, you'll anchor for 2 hours, depending on the wind and weather either in Cala Mitjana, Cala Serena, Cala Mondragó or Cala Barca (snorkelling equipment is provided). During anchoring, you can enjoy the delicious lunch buffet on board. Subsequently, you'll continue sailing to the harbour of Cala Virgili or Cala D'Or, where you can go for a swim in a dreamlike bay and coffee and cake will be served. After this stop, you'll sail back to Porto Colom / Porto Cristo for about 1.5 hours. After a brief introduction on board, we begin to sail around Mallorca for 2 hours along the east coast. At one of the beautiful bays of Mallorca, we stop for one hour, depending on the wind and weather either in Cala Mitjana or Cala Sa Nau (snorkeling equipment is provided). Meanwhile, you can enjoy the prepared snacks and drinks on board. Finally, we start sailing back relaxedly to Porto Colom or Porto Cristo. Transfer possible upon request within 30 minutes / 30km of Portocolom for at least 2 people. Transfers from areas further away may be possible but you have to pay extra for those. If the weather is extremely bad (stormy or rainy) the romantic cruise will have to be moved to another date. If no alternative date is possible, the sailing trip will have to be cancelled and you will get your money back. If the customer cancels, these are the charges: Up to two weeks in advance - 50% of the price and in less than 48 hours - 100% of the price. Spend an unforgettable sailing trip in Majorca on board a marvellous sailing boat! Discover the most beautiful bays when sailing in Mallorca and swim in the turquoise and crystal-clear Mediterranean sea, far away from the crowded beaches. The sailing trip from Porto Colom or Porto Cristo starts with a little introduction on board, before you'll sail from the picturesque harbour (approx. 60km from Palma) in the direction of Cala Millor, Sa Coma or to the idyllic Colonia Sant Jordi. Get spoilt by the sun and relax on deck of the comfortable sailing yacht. If you like sporty challenges, you can help setting the sails or steer the sailing boat on your own. Treat yourself with the best sailing trip in Majorca in a relaxed and friendly atmosphere! Do you just want to have your first sailing experience during the day or do you plan a romantic sailing trip in Majorca as a couple to enjoy the sunset over the Majorcan sea? Sail for half a day or a full day along the stunningly beautiful coasts of Majorca. It doesn't matter if you go sailing in Mallorca with a group of friends, as a family, a couple or on your own, on this sailing day trip, you will forget all your troubles! This sailing trip in Mallorca takes place in a small, exclusive group with a maximum of 11 people. Additionally, you can savour the Mediterranean cuisine with a buffet or snacks and drinks of your choice during the sailing tour. Get spoilt by the experienced skipper when sailing in Mallorca and feel at home on the sailboat. The full day sailing trip in Mallorca is conducted by a skipper with more than 70,000 nautic miles of experience in sailing along the coast and out in the open sea. He will show you the most beautiful bays of Majorca for a little swim in the turquoise-blue water. Get to know him in this interview. Juan is a passionate sailor and he will show you his island on one of the best sailing trips of Mallorca. With Mallorca sailing, you'll experience the typical Majorcan lifestyle. Enjoy the almost everlasting sunshine, snorkel in the Mediterranean sea and amuse yourself by having a decent conversation with the skipper and the other sailing guests - or sit down just in the front of the big deck and admire the wide views on the open sea calmly when sailing in Mallorca. If you want to charter the sailing boat exclusively for you and your group, you can hire it here. Ein super toller Tag auf dem Mittelmeer, wir waren mit Skipper 6 Personen. Der ganze Tag war der Knaller, noch einmal recht herzlichen Dank an unseren Skipper Alex. Wir haben sowas schönes noch nicht erlebt! 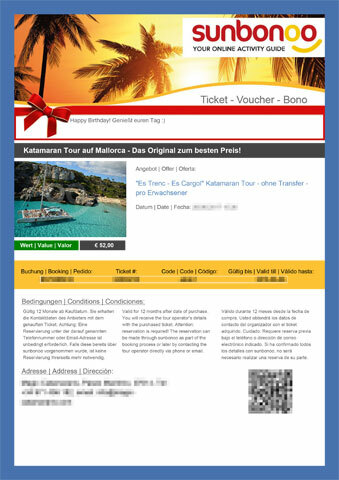 Diesen Segeltörn hatte ich meiner tollen Frau Gisela zum Geburtstag geschenkt, ohne zu wissen, dass es gleichzeitig auch ein tolles Geschenk für mich selber war. Wir hatten für Anfang Juni diesen Segeltörn geplant. Sunbonoo rief uns dann an, dass wir wegen Sturm Warnung um 2 Tage verschieben müssen. Statt von Porto Colom, ging es dann von Porto Cristo aus aufs Meer. Die Betreuung von Sunbonoo war perfekt. Unser Skipper, der Juan, war ein sehr freundlicher und auch lustiger. Klasse auch, das er problemlos in Spanisch, Englisch und Deutsch bewandert ist. Top! Wir sind dann erstmal ziemlich weit aufs Mittelmeer raus gesegelt. Bange fragen, obs auch wieder heile zurück geht, wurde mit einem fröhlichen Lachen bejaht. Jeder hat mit angepackt, obwohl, so unglaublich das auch klingt: dieses 24 Tonnen und 19 Meter lange Segelschiff – eine Hanse 630E, kann auch eine Person ganz alleine Segel/Steuern. Wir haben mehrere fast Menschenleere Buchten angesegelt. In den Buchten konnten wir dann Schwimmen, Schnorcheln oder auch einfach nur das fantastische Wetter genießen. Zwischenzeitlich bereitete Juan der Skipper leckeres in der Kombüse vor. Dank auch an die tolle Truppe aus Stuttgart und auch an Rebecca und Garvin aus NRW. Hat richtig Spaß gemacht mit euch. Besonderen Dank nochmal an Juan. Wie er mir (den absoluten Segel Laien) alles in einer Bären Geduld erklärt hat. Richtig Klasse! Gerne noch einmal. The skipper welcomed us with the words that today would be the best day of the holiday and he was right. We were 7 people on the boat and had enough space. The food was delicious and we had plenty of time for snorkeling and sunbathing. Anyone who wanted to be allowed to take the wheel even in the hand. We were picked up in the morning with a delay of 30 minutes, but half an hour was hung up and so we sailed back to the bay of Porto Colon at sunset. Emergency medicine was also on board for passengers suffering from nausea. Each couple had their own berth to move and store things and a fully functional toilet was also on board. All around very successful sailing trip! Der Skipper begrüßte uns mit den Worten, dass es heute der schönste Tag des Urlaubs werden würde und er hatte recht behalten. Wir waren 7 Personen auf dem Boot und hatten ausreichend Platz. Das Essen war lecker und wir hatten viel Zeit zum Schnorcheln und Sonnen. Wer wollte durfte auch mal selbst das Steuer in die Hand nehmen. Wir wurden morgens zwar mit 30min Verspätung abgeholt, jedoch wurde die halbe Stunde drangehängt und so sind wir bei Sonnenuntergang zurück in die Bucht von Porto Colon gesegelt. Auch für Passagiere, die mit Übelkeit zu kämpfen hatten, war Notfall Medizin an Board. Jedes Paar hatte ihre eigene Koje zum Umziehen und Sachen lagern und eine vollfunktionsfähige Toilette gab es auch an Board. We booked a full-day sailing trip and were in September with a Bavaria 49 of the Caribia Yachtcharter. We had a great skipper (Nico) and a super co-skipper (Mike). The food was great and fresh and the sailors were great. I was skeptical at first, if the tour is worth the price, but I must say: 100%. We would definitely go there again. Wir hatten einen Ganztages-Segeltörn gebucht und waren im September mit einer Bavaria 49 der Caribia Yachtcharter unterwegs. Wir hatten einen tollen Skipper (Nico) und einen super Co-Skipper (Mike). Das Essen war super und frisch und die Mitsegler waren klasse. Ich war anfangs skeptisch, ob die Tour den Preis wert ist, aber ich muss sagen : zu 100%. Wir würden auf jeden Fall nochmal mitfahren. We had a wonderful trip. They shared 9 people plus skipper and were out all day. We were also glad that we booked the whole-day excursion, since you just have more of it. First we were sailed a little before we had time to swim and snorkel in a wonderful bay. On the occasion it also had a delicious lunch. Then we sailed into another bay and went there again anchors before it went back about 5pm. An absolutely great day and we would do it again and again. The costs are also absolutely understandable. Wir hatten einen wunderbaren Ausflug. Waren zusammen 9 Personen plus Skipper und waren den ganzen Tag unterwegs. Wir waren auch froh das wir den Ganztagesausflug gebucht haben, da hat man einfach mehr davon. Zuerst sind wir etwas gesegelt bevor wir dann in einer wunderbaren Bucht Zeit zum Schwimmen und schnorcheln hatten. Bei der Gelegenheit habe es auch einen leckeren Lunch. Danach segelten wir in eine weitere Bucht und gingen dort erneut vor Anker bevor es dann gegen cirka 17 Uhr zurück ging. Ein absolut toller Tag und wir würden es immer wieder tun. Die Kosten sind auch absolut nachvollziehbar. hiermit möchte ich kurz von unserem (6 Erw.) Segelturn im Juni 2016 berichten. Unter den vielen Anbietern haben wir mit Sunbonoo genau den richtigen getroffen, zu dem Turn wurde ein Shuttleservice angeboten und obwohl wir außerhalb des Radius lagen klappte es äußerst unbürokratisch und sehr günstig. Das Schiff war tiptop und der Skipper sowie die Betreuung vor Ort perfekt. Alle unsere Wünsche bezgl. Buchten , segeln, baden,essen usw. wurden gerne erfüllt. Alles in allem ein rundum gelungener Ausflug. Wir hatten viel Spaß, buchen gerne wieder und wünschen dem Team eine tolle Saison. It was an unforgettable experience. We had the boat with our group for us. Very nice skipper who with great bound us. The controlled bays awesome. The settlement on the Sunbonoo team was great. Thank you so much ! Es war ein unvergessliches Erlebnis. Wir hatten das Boot mit unserer Gruppe für uns. Sehr netter Skipper, der uns toll mit eingebunden hat. Die angesteuerten Buchten genial. Die Abwicklung über das Sunbonoo Team war super. Vielen Dank ! Toller Segeltörn mit gastfreundlicher Crew. Wir durften zu viert einen tollen Nachmittag auf der Bavaria 49 geniessen. Zum Sonnenuntergang segelten wir dann in den Hafen von Portocolom zurück. Die Segelbegeisterten durften sogar das Ruder übernehmen. Die Bucht, die wir wärend unseres Törns amgesteuert haben hatte türkisblaues Wasser. Buchung und Abwicklung war unkompliziert und trotz Feiertag kurzfristig buchbar! Ausflug ist wärmstens weiter zu empfehlen. Kann mich meinen Vorgängern voll und ganz anschliessen.super Betreuung vom sunbonoo-Team,schnelle Reaktion bei Anfragen. Auch der Segeltörn war für alle ein tolles Erlebnis(Vollcharter). Pickup auch bei unser nicht leicht zu findenden Finca klappte bestens. Pick up worked great. Skipper was very nice and the trip very nice. Gladly again! Pick up hat super geklappt. Skipper war sehr nett und der Ausflug sehr schön. Gern wieder! Very nice trip for the family, skippers were extremely friendly and entertaining. The Sunbonoo team has even personally advised me and I have to thank for this great recommendation! Sehr schöner Ausflug für die Familie, Skipper waren äußerst freundlich und unterhaltsam. Das Sunbonoo Team hat mich sogar persönlich beraten und ich muss mich bedanken für diese tolle Empfehlung! You're reviewing: Amazing half-day or full-day sailing trip in Mallorca. How do you rate this product?